Adrian Russi is one of the leading CI teachers in Switzerland and travels all over Europe to teach and perform Contact and Free Improvisation. He has been deeply involved in CI since 1992 and since then has dedicated the greatest part of his life to this wonderful dance form. After studying Modern Dance at 'bewegungs-art' in Freiburg/Germany he continued his education with many different teachers, including Steve Paxton and Nancy Stark Smith who had started to develop CI in the early 1970s with a group of other dancers. He offers his work as a freelancer to a wide range of people and also regularly gets invited to teach in schools. In his teaching he focuses on the technical aspects of CI (ease, precision and strength) as well as on matters of perception (sensation, connection of inner and outer space, of bottom and top) and on a creativity coming from a distinct body-awareness. For him the pleasure of play, of deep engagement in dance, and respect for others are the basis for gaining the best possible experience from dancing CI. As a performer he works with many different international artists and his performances are primarily based on Free Improvisation incorporating Contact Improvisation, dance, dance-theatre, voice and live music. In 2007 he initiated "Moving Men", a men's trio with Charlie Morrissey and Jacky Miredin touring with there performance-work all over Europe. 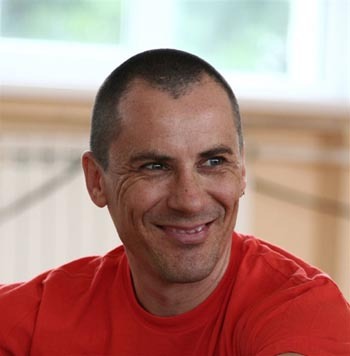 As an organizer of CI-events he is involved in many festivals, jams and teachers-meetings, among them the "Moscow Contact and Performance Festival". Aware of your own centre and the inner axis, connected with the floor and the whole space: this is the very basis for becoming deeply involved in a contact dance that will lead you beyond gravity and into an on-going falling in all directions and into new spheres. With ease and safety and without taking unpredictable risks! Communicating with your partners' body is one of the key ingredients, combined with precise movement techniques and highly developed body awareness. In a state of alertness, curiosity and with an open intuition, dancers are able to handle surprising moments and make decisions in a split second in order to form the dance in collaboration with their partners and others in something called Contact Improvisation. In this workshop we will experiment with different movement principles to challenge our body and our range of perception. We will move solo, and with partners, to encounter and experience gravity in a new and creative way. There will be space for free dancing, for verbal exchange and for silence to acquire a deeper understanding of this dance form, and to integrate the new material in your own dancing. Come prepared to have fun, to meet other dancers in a new way and finally to find your own pathway through dance. 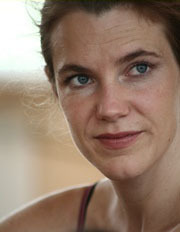 Manuela Blanchard Russi (originally a sociologist/ethnologist from french speaking Switzerland) has taught contact improvisation and new dance for the past 7 years after having trained intensively and performed in dance, physical theatre, clown and synchronised swimming for the past 20 years. Discovering improvised dance touched a very profound core in her, and led her to meet great teachers (such as Steve Paxton, Nancy Stark Smith, Kirstie Simson, Martin Keogh und Andrew Harwood) and to continue to explore the form with others. Manuela is also a water body therapist, certified in "Watsu" & "Water Dance", and trained in "Healing Dance". 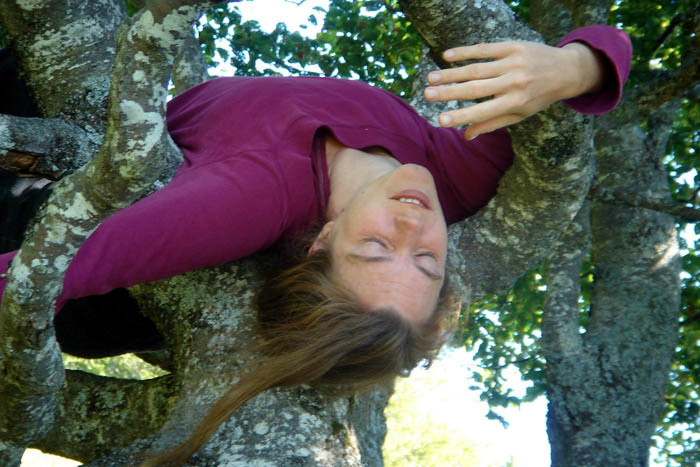 Her love for contact improvisation and aquatic bodywork has brought her to teach regularly contact dance in water, in nature and on the dance floor, in Switzerland and abroad. She is also Esalen Massage practitionner (Californian bodywork). The dance will start with us being outdoors, well-rooted in the ground and in dialogue between our centre, the centre of the earth and the centres of our partners. We will go on an inward journey where we will explore the resonance of our body landscapes, in touch with the natural surroundings: sand, sea, trees or street jungle, each of which will suggest to us different movements qualities, and will call forth different imagined things and stories. Alone and in a group, we will engage into a sensual and playful approach to our environment, using our skin and our senses as interfaces and spaces to meet. The sand and the stones embracing our shapes open us up to subtle touches or sometimes wild body waves. It will lead us to instant group composition, by trusting in the dance that wants to grow at that given moment through us as human plants. Georgia Petrali is a dancer, choreographer, and dance teacher. She was born in Crete, Greece. She studied classical and new dance (instant composition) in England and continued her postgraduate dance studies at the Rotterdamse Dansacademie in Holland with a grant from the Alexander S. Onassis Public Benefit Foundation. Having received a bursary, Georgia Petrali was Greece's first participant in the international dance festival, Dance Web in Vienna in the summer of 2000. She has taught movement, improvisation, contact-improvisation, classical ballet and contemporary dance in England, Switzerland, Portugal and Greece. As a dancer she has collaborated with the dance companies Manc Dance Company, Terpsicorrick Dance Company and Doris Vuilleumier Compagnie abroad. In Greece, she has participated in performances of Haris Mantafounis, Artemis Ignatiou, Natasa Zouka, Carol Brown and Luca Silvestrini. In 2004 she took part in the choreography team of Dimitris Papaioannou and Angeliki Stellatou as assistant choreographer for the Opening and Closing Ceremonies of the Athens 2004 Olympic Games. In 2006 she founded the dance group ‘Fysalida’, based in Heraklion, Crete to explore, create and present artworks in the regions through collaboration with artists, educators, therapists and scientists from Greece and abroad. 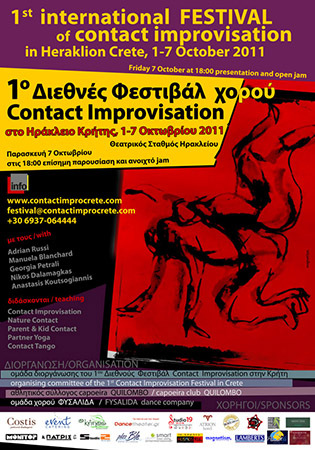 Productions for Fysalida which Georgia has directed, choreographed and danced in include the solo performance ‘Flock-the stargazer’ (2007) and the video-art pieces ‘Rooms’ (2006), ‘Flock-the Stargazer’ (2007), ‘Insect’ (2009), ‘The 7 deadlies in a relationship’ (2009) and ‘Phobias’ (2010). In 2008 she directed and choreographed the film ‘Wrinkles and Dreams’ starring the picturesque neighbourhood of Agia Triada in Heraklion, Crete. 120 amateurs, professionals and residents of the local area took part in the film. The entire project involving all these people was based on the concept of community dance. The film has won 5 prizes in Poland, Greece and Romania, and has taken part in various festivals in Greece (Athens, Thessaloniki, Drama, Heraklion, Kilkis, Rethymnon, Patra) and abroad (Japan, Poland, Italy, Portugal, Bulgaria, Hungary, Jordan, Turkey, Atlanta, Romania). In 2010 she directed and choreographed for Fysalida Dance Company the dance theatre performance ‘Moments of Metamorphosis’. The characteristics of this specific production are that it uses a winery in the village of Houdetsi Crete to stage the performance, and utilises the change from natural to artificial light, combining the natural beauty of the landscape with the special features of the interior of the winery. Taking an architectural look at the various places where an artwork is presented and collaborating with professional and amateur artists and with ordinary people through community dance are characteristic technical features of the artistic activities and productions prepared by Georgia Petrali. By using breathing exercises, body positions used on a day-to-day basis, and simple contemporary dance and improvisation techniques, we will attempt to make the body conscious of what is needed to move with clarity, flow and awareness of its own movement. Our goal is to discover the different qualities of each and every movement and to explore the flow of the movement within the body and space in which we exist. We will focus our attention on the moods which we experience and on how they affect our relations with the rest of the group. What is of concern is to discover space within and outside our body, setting the rate and pace of our own self and utilising time via the different melodies that a properly trained body can generate. The principle of movement, and of maintaining and developing that movement via bodily contact, the unpredictability of each and every moment and the forces of physics (gravity, controlled impetus, continuous flow and action/reaction) lead bodies to co-exist as a unique entity, a web of movements which are constantly evolving and reforming, changing shape within space and time. Collective effort and a personal exploration carried out by each member of the group, trust and frankness, concentration, precision, awareness of and care for the body will be the main tools employed as the seminar unfolds and develops into something deeper and more instinctive. Movement and expression are just as important for children as they are for adults. 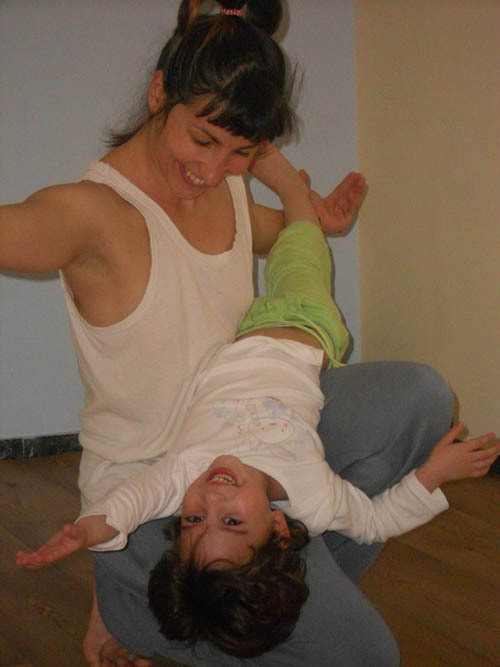 We have developed an activity encompassing the relationship between parents and children that encapsulates movement, expression and creativity. Through games, images and the body positions we use every day we will attempt to restore the vitality and joy to our bodies that is needed for it to move carefully, flowingly, with emotion and imagination. We will utilise simple improvisation techniques, exercises and images that can help expand our imagination. Taking a joyful and enthusiastic approach, we will be concerned with discovering the space within and outside our body, setting the rate and pace of our own self and utilising time via the different relationships and conditions that a body can generate and produce. By exploring the relationship between parent and child, through collective movement, we seek to get to the roots of real relationships and to understand group structures in general. We invite all parents, mums and dads, to bring their children along and to move around and express themselves along with us! Children's ages. 2-5 years old. Parents should come equipped with: love, interest, a desire for action and a sense of imagination about what children can do, about movement, and about being in a group. Anastasis is a certified Hatha Yoga teacher, massage therapist and former professional dancer who began the yoga journey in 1994 in Varanasi (India). 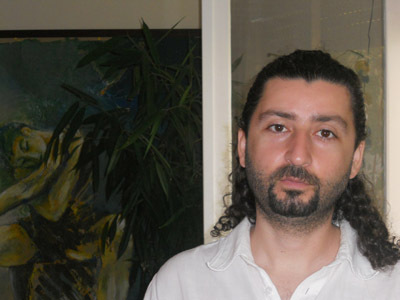 He is now giving classes in Hania and also participates in various seminars in South East Asia and in Greece. He studied Hatha, Ashtanga and Anusara Yoga in India with B.N.S. 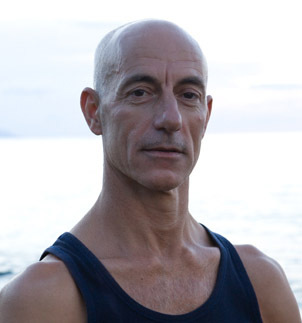 Iyenkar, in Thailand with Yonas Westring and in America with Richard Freeman and at several Yoga & meditation retreats. His teaching is a blend of this broad & extensive background with Anusara inspiration. Partner Yoga deepens our understanding of Yoga and our awareness of others. Yoga is a way of uniting the self with the world. 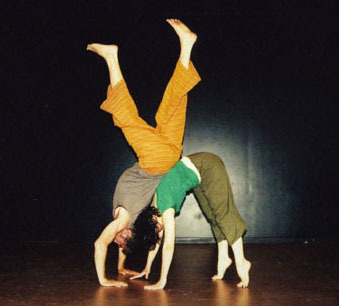 Yoga with a partner-breathing together, guiding and supporting one another is a creative and playful journey that connects us to each other in the present moment. ps: bring your yoga mat, or even better a camping mat and a towel. From an early age, Nikos Dalamagkas was involved in dance and music. Somewhere along his dance career, having explored various types of dance, he discovered tango argentino. He studied it; explored it and learned much and travelled to many European milongas and festivals dancing until he could make his dream a reality: he visited Argentina and stayed in Buenos Aires, learning more about the various styles of tango, kinesiology and choreography. He is the organizer of the Tango Festival: Sunny Tango Vacations. His studies in physics, his involvement with music, tai chi, body expression and contact improvisation have affected how he teaches tango, allowing him to maintain a balance between and respect for tango traditions while integrating new developments too. We will start off by working on basic tango techniques so that we all acquire a common tango vocabulary. Using elements from contract improvisation, we will examine key principles of musicality, expressiveness and improvisation in tango. Drawing on images and ideas from our day-to-day lives as inspiration, we will explore the power of a tight embrace and relaxation from it in order to achieve a more flexible and interactive relationship between the pair. We will discover more contact and tango dance methods, beyond the classical chest-to-chest embrace. Every point of contact can become an embrace with one or more fellow dancers. The pair no longer needs a leader and a follower. Both lead and are led at the same time. Anyone who has any experience with tango, contact improvisation, modern dance or some form of dance and movement, no matter how little, can take part in this seminar. It is not necessary for you to come with a dancing partner. Wear comfortable, loose clothing and soft shoes without any heel, or alternatively wear socks, or even better still come barefoot.